Before turning to healthcare as a career in 1994, Kathleen Bartholomew held positions in marketing, business, communications and teaching. It was these experiences that allowed her to look at nursing from a different perspective and speak poignantly to the issues that effect nurses today. A registered nurse and counselor, Kathleen has been a national speaker for the nursing profession for the past several years. As the manager of a 57-bed surgical unit in Seattle, she quickly recognized that creating a culture where staff felt a sense of belonging was critical to retention. Throughout the Swedish Medical Center, Kathleen spoke to the numerous factors which propel our society toward isolation and encouraged staff to connect and value one another. During her tenure as manager, staff, physician and patient, satisfaction improved significantly as she implemented her down-to earth strategies for creating community. Despite the nursing shortage, Kathleen could always depend on a waiting list of nurses and nursing assistants for her unit. Kathleen's Bachelor's Degree is in Liberal Arts with a strong emphasis on Sociology. This background laid the foundation for her to correctly identify the norms and mores particular to healthcare - specifically physician-nurse relationships and nurse-to-nurse hostility. 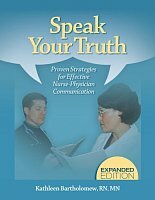 For her Master's Thesis she authored Speak Your Truth: Proven Strategies for Effective Nurse-Physician Communication which is the only book to date which addresses physician-nurse issues. Exceeding marketing expectations, Speak Your Truth was well received by staff nurses who could easily resonate with Kathleen's narrative style and "down in the trenches" material. In her latest book, The Dauntless Nurse: Communication Confidence Builder, Kathleen teaches you how to pro-actively address and eliminate the trivial and unnecessary frustrations that distract and undermine your confidence. She consistently captures her audience with the power of story as her participant evaluations illustrate. Kathleen consistently captures her audience with the power of story as her participant evaluations illustrate. In December of 2005, Kathleen resigned her position as manager in order to write a second book on horizontal violence in nursing. The expression, "why nurses eat their young" has existed for many years in the nursing profession (and has troubled many in the profession). 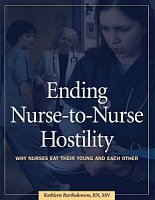 In her book, Ending Nurse to Nurse Hostility (2006), Kathleen offers the first comprehensive and compassionate look at the etiology, impact and solutions to horizontal violence. With statistics demonstrating that 60% of new grads leave their first position within six months because of some form of lateral violence, this subject cannot be ignored. Kathleen has presented her work at The Honorary Society of Nursing's International Sigma Theta Tau Conference in Vienna, Austria. Kathleen's passion for creating healthy work environments is infectious. 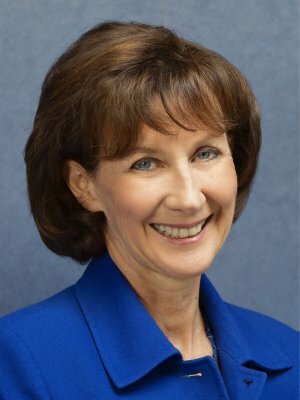 She is an expert on hospital culture and speaks internationally to hospital boards, the military, leadership and staff about safety, communication, cultural change and power. With her husband, John J. Nance, she co-authored, Charting the Course: Launching Patient-Centric Healthcare. From the bedside to the boardroom Kathleen applies research to practice with humor and an ethical call to excellence. Everyone that hears her is inspired. This presentation tackles the question of what to do now regarding increased dependency on HCAHPS and patient satisfaction metrics, CMS pressures and curtailed reimbursement, the expanding list of "Never" events, and the massive challenge of creating a unified organization from a collection of siloed fiefdoms. This dynamic program takes you with great clarity into the heart of exactly what steps must be taken by senior and middle management to lead your people to break free of the "Way we've always done it" syndrome. It gives virtually everyone in the American Healthcare setting a crystal-clear understanding of what has to be done, and in what order, to create a unified institution whose members from bottom to top are truly dedicated to zero harm, the highest quality of care, communication, teamwork in its highest expression, and a common level of ownership. This presentation is co-presented with John J. Nance and based on the sequel to Why Hospitals Should Fly which is called, Charting the Course: Launching Patient-Centric Healthcare. The ever increasing demands of leadership have not allowed today's leaders the luxury of time needed to step back and look at the 'big picture'. The biggest failure of all has proven to be the most critical: a failure of perception. Culture has repeatedly been identified as the greatest barrier to patient safety (IHI). What is this phenomenon that travels as a powerful undercurrent in organizations? And how can leaders' un-mine and control an invisible force? Using Professor Diamond's framework (Collapse), for "How group decisions fail," this presentation offers a fresh and fascinating look at the hospital safety culture in light of sociology. Patient safety can never be achieved as a top-down driven initiative. Safety is a core value. In this session, leaders will learn how to identify their culture beyond the statistics and sustain the value system and behaviors critical to keeping our patients safe. The expression "Nurses eat their young" is so far removed from our idea of the caring and nurturing nurse that we shudder to think it could possibly be true. Bur the truth is, nurses are hurting each other. Stories from the 'front line' cannot be ignored. These stories are the voices of nurses telling the world about their experiences. In addition, research shows that 60% of newly registered nurses leave their first position within six months because of some form of abuse from a co-worker. The first step to healing our relationships is the most difficult: to recognize and openly discuss the problem. Only by understanding the origin and reasons for our behaviors can we even begin to create the healing environment that is so desperately needed in nursing- for ourselves, as well as our patients. As a culture, studies show that both physicians and nurses fall short of communicating their concerns to their colleagues because of a passive-aggressive style of communication and conflict avoidance. Clearly, if we are to deliver the highest level of safe, quality care and create the collegial relationships that will nurture and support each other, we must learn a new way of engaging with each other. Participants will leave this presentation prepared, empowered, and determined to engage in the conversations they have been avoiding. The field of "Knowledge Utilization" has identified the optimal information needed at different points in an organization for people to best maximize their effectiveness. According to this research, the 'generals' need the concepts and the 'captains' need strategies and tactics. Unfortunately, the ever increasing demands of nursing leadership have not allowed nursing leaders the luxury of time needed to step back and look at the 'big picture' and lead today's nurses. Using Professor Diamond's framework (Collapse), for "How group decisions fail", this presentation offers a fresh and fascinating look at the nursing profession within the American healthcare system as well as a 'call to arms' for rallying together in light of this crises. Improving MD/RN Relationships: "I'm OK, You're A Doctor: The RN/MD Game"
It's the patient who loses when nurses and physicians are in conflict. Research shows that not only do poor nurse-physician relations affect morale and retention, but also patient mortality. In order to achieve best practice, we need to understand why we play this game and how it started. Learn practical strategies for building good relations that will be ego-boosting for both nurses and physicians and leave this presentation with the courage and determination to improve your working relationships. Nursing is both a science and an art. The science of nursing requires us to stimulate our minds while the art of nursing engages our soul. As we tackle the everyday challenges, it is clear that many of us have forgotten the joy of nursing. Using the power of story, Kathleen inspires nurses to be in awe and appreciation at nurses' work. This lecture challenges how we look at our own profession, reminding us through the story of the moments where we have connected to another human being on the deepest of levels as we help them to deal with the gamut of human emotions. When we encourage the role of nurse as artist, and integrate these qualities into our daily routine, we unleash our own personal power - Nursing then becomes a place to be nourished rather than drained.